I am happy to live frugally so that when I do spend money, I can do so without feeling guilty. I most certainly do not want my frugal life to mean I don't do anything fun or buy myself something that I really want. I want it to mean that when there is something I want to do or buy, I can afford it because I haven't piddled away all my money on meaningless expenses. Next month, I have a week off of school for spring break. To take advantage of that time off, Bart and I will be going to Mexico for a week. Is travel a luxury? Of course it is. If we had absolutely no extra money at all, would we travel? No. I would rather eat than go on vacation. But we do have some extra money. We could have spent it on eating out more often or having cable or a bigger apartment or a nicer car or a better wardrobe or any of a thousand possible things. But we certainly couldn't afford to do all those things. Instead, we prioritize what matters to us (in this case, a last big vacation before our baby is born later this summer), and budget our money so that we can afford to do those things. Before Christmas, we bought our plane tickets to Mexico. Last month, we paid the entirety of our rental car and hotel (which includes food) costs for the trip. We know we can afford to take this vacation. We've already paid for 99% of the trip (I'm assuming we'll have a few incidental costs while we're there). We won't have to come home and worry that we won't be able to pay the credit card bill. I don't have to worry that maybe we can't really afford this trip or that we'll have to eat raman noodles for a month afterwards. For me, that is frugality paying off in a very tangible way. I can enjoy the things I really want to in life because I'm living frugally enough in other areas to do so. Think how much more pleasant Christmas would be if you didn't have to stress about the credit card bill that was going to show up in January. Think how much more enjoyable your new car would be if you didn't have to feel guilty about the financial burden it was every time you turned over the engine. Being frugal means you can afford to do the things that matter to you, whether that's owning a boat or taking nice vacations or living in a better neighborhood or sending your children to private school or having 4355 channels or having an iPhone. It means you don't have to stress and worry that you shouldn't be spending the money there or that you'll have to pay in other major, uncomfortable ways to make that happen. It means you can enjoy it when you do spend money, because you aren't spending money in every category, even categories that bring you little satisfaction. And since I don't like guilt or stress (and certainly not a combination of the two), that's a pretty good reason to live frugally in my book. I agree 100%. Traveling was very important to my family when we were growing up. We lived frugally the rest of the year but always had fabulous vacations in the summer (Europe, Israel, etc.) I remember my friends assuming we were rich...not so. Yes, my parents had plenty to live on, but they were also very smart with the money and we were able to enjoy it doing things we REALLY wanted to do. This is another great post that caused me to think!!! I totally feel this way, now to make even more changes to act this way! So so true. I couldn't agree more. Have fun in Mexico! I love, love, love this! We love to travel and it is so true. It is so easy to say no to fast food when you know you are saving for a fabulous trip. Or on the flip side when your husband has an unexpected trip to Europe for 9 days but only has to work 2 1/2 of them, it is so nice to have that extra $$ around so you can go with him! Have fun in Mexico! 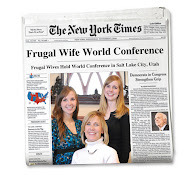 Can't wait to hear about finding frugal travel deals.